I bet you weren’t expecting that were you? A perfect score, the highly coveted “Omar Stamp of Perfection” Well this movie deserves it and I don’t blame you if you’re hesitant to believe me. If someone had told me a few weeks ago that there was a Roomate-Vampire mockumentary out there worthy of a perfect score I would’ve said, “That sounds awesome, where do I sign-up?”…but I wouldn’t have expected it to actually live up to the perfect score claim. But hey don’t take my word for it, with 131 votes on the trusty Rotten Tomatoes meter the film still sits at a nice and ketchupy 96%. The New Zealand horror-comedy What We Do in the Shadows was co-written and directed by Taika Waititi and Jemaine Clement (one half of the band Flight of the Conchords!). Along with writing and directing, both of the aforementioned star in the film as the vampires Viago (age 379) and Vladislav (age 862) respectively. These two are joined by Jonathan Brugh as Deacon (age 183) and Ben Fransham as Petyr (age 8,000). These four make-up the original tenants of the flat in Wellington that we are introduced to. The basic premise of this film is that these four vampires of various ages have hired a camera crew to follow them around and document their lives. The camera crew is hardly ever interacted with directly or even referenced, the whole thing was reminiscent of The Office in that way. Anyway, these guys all come from different eras and get into all sorts of shenanigans when they awaken for their night-time adventures. The premise of the movie was so simple yet brilliant and was one of my favorite things about the film. I mean, when else have you seen a morbidly hilarious DOCUMENTARY following the everyday lives of vampires? Vampire movies tend to be a serious affair. By nature of the film being a “documentary”, some of the funniest moments arise when the cameraman decides to focus on certain facial expressions, reactions, and oddities that would otherwise be out of place in any other type of movie (again, think of The Office). There are tons of good jokes here that arise surrounding the topic of roommate tensions that any non-vampire can relate to like sharing responsibilities, getting along in one household, etc. These moments are great by themselves but the funniest moments arise when paired with the deceptively deep mythical creature lore this movie packs in. For example, Petyr is obviously supposed to be Count Orlok of Nosferatu (1922) fame. Not coincidentally, Petyr happens to be the most violent and serious vampire of the bunch. Then there’s Vladislav who casually has a human slave and torture chamber and happens to be strongly suggested to be Vlad the Impaler. So those references are awesome but then there’s the hilariousness that arrives with the struggles of being a vampire in a modern society. For example, how do you know if you picked a good outfit to go clubbing in if you have no reflection? How do you even get into a good club if vampire law dictates that you need to be explicitly invited inside before you can cross a doorway? What do you do when the love of your life, a human, is old and frail? Most importantly, how do you drain a victim of their blood in your apartment without having to worry about the bloody mess afterwards? I was mentioning the lore earlier and that point goes deeper than just vampires. Throughout the movie there are interactions with vampire-hunters, werewolves, zombies, beasts, witches, etc. Clearly the movie has plenty of good material to work with but the writing and directing really make is something special. Like I said, the choices of what to say and show and what not to were made brilliantly and made the movie a very well balanced comedy. The script honestly seemed perfect to me with so many hilariously subtle moments. the acting was fantastic as well! All the characters represented their characters very well but I won’t pretend that this has nothing to do with the fact that I haven’t seen these actors in any other roles. I really don’t know how much more I can say about this movie. The costumes were spot on, the crappy apartment was spot on, the style was spot on, everything seemed spot on. It’s not big secret that pretty much every time Liz and I want to watch something we simply find an online stream to do our watching. Liz prides herself on being able to find streams for any movie and show ever made. This was one of those very rare moments when neither of us could find a stream but I decided to just rent it on Amazon for a few bucks and I don’t regret the decision in the slightest. The only thing I didn’t like was that I read recently that there are plans for a sequel. I was put off by this idea not because of anything wrong with the this film but rather because of everything right about this film. It just seems like one of those movies that is so original and well done from top to bottom that they couldn’t possibly make another without ruining it or rehashing old jokes. That’s none of our concern here though is it? The moral of the story here is, GO WATCH THIS MOVIE! Hello everyone! I apologize for the extended absence but I’ve been quite busy lately relocating for the start of law school. The move along with the taxing orientation week and reading assignments left me very little time to keep up with my reviews. But enough excuses! 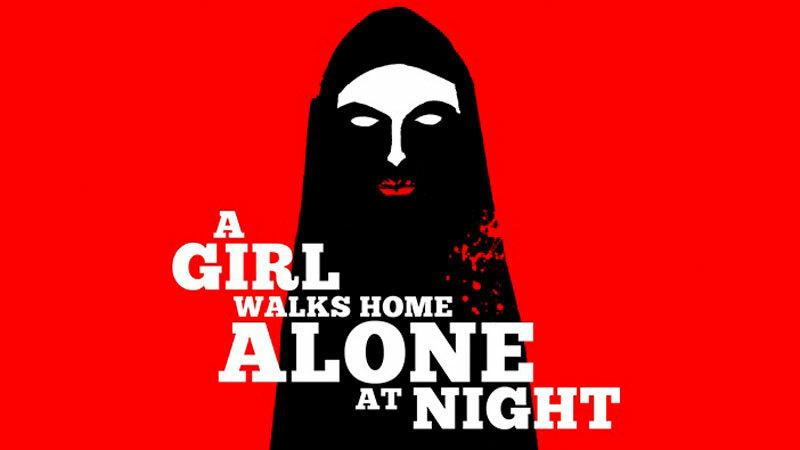 I’m back and better than ever, time to dive into A Girl Walks Home Alone at Night. Pretty cool poster or title screen or whatever its called right? Well I personally think so, it sets the tone for what amounts to a very stylish vampire flick. AGWHAAN (quite the mouthful) is the horror-romance directorial debut of Iranian-American director Ana Lily Amirpour. Not only did she direct the movie, she wrote it as well. This movie is pretty badass in a lot of ways not explicitly related to it’s content. First of all, it is directed by an Iranian-American Woman which places it in a rare category already. Second of all, it came with the description of being “The first Iranian vampire Western” which makes it even more cool. Hype and reputation can only get you so far though, at some point the movie has to speak for itself. The quick summary of this movie is that it revolves around a small Iranian town and the life of a young man going about his daily life, a stealthy female vampire who stalks her prey, and their eventual interactions with one another. It must sound to you that there is more to the story than I’m describing but that’s pretty much the gist of it. My main gripe with the film is that in the end it was sort of uneventful. Nothing big ever really happened, this movie reminded me a lot of Jim Jarmush’s Mystery Train (1989) in that regard. The story is very minimalist and doesn’t have a problem lingering on certain scenes where nothing substantial happens. After reflecting on it for some time, this isn’t necessarily a bad thing and can be a refreshing break from typical storytelling formulas but I personally like a little more meat on my stories. But let me digress, there is plenty this movie does extremely well that elevate it beyond the plot. For starters, I loved the black and white style they went with in this film. Liz quoted me in her review as saying the movie seemed “very crisp” and I stand by that. Given that almost every modern movie is filmed in color, we don’t get too many new black and white movies which means the visuals I have to compare to are typically more grainy and dated. This movie reminded me an awful lot of the Coen Brothers’ The Man Who Wasn’t There (2001) in that it was a black and white film that was very sharp and clear. Another thing I loved about this movie was the atmosphere, and this is another thing that was greatly helped by the black and white style. The movie was very eerie and almost surreal being that it takes place in a desolate city where we’re often watching a vampire stalk her prey. While the minimalist style meant the story didn’t do too much, it did open up the possibility for many other cool things that I greatly enjoyed. For example, instead of having to fill moments with dialogue and action, we’re treated to extended moments of aesthetically pleasing scenes like the stalking scenes, the Halloween dance scene, and scenes of people walking around the city. This might sound a bit boring but I’m way underselling it, it was great. The movies does this really cool thing with the vampire scenes where you see her parallel to someone she’s following, on different planes, and the camera will focus back and forth between the two characters. This movie utilized that fade-in and fade-out technique often and it worked very well. Following with the minimalist style, the sounds of this movie were also great. There were a few very specific moments when there was a spectacular soundtrack but outside of those moments the movie was filled with tons of ambient sounds like footsteps, wind, etc. and it fit the movie so well! All of these elements combined to make a movie that was incredibly stylish, cool, and simply put, beautiful. I can’t remember who it was that said this or where I read it but someone once said that filming in black and white was like “painting with light” and exploring with endless shades of gray. Whoever said that was dead on in how beautiful they made it sound and this movie is testament to that. We tend to watch vampire movies these days where it is assured we’ll see iconic flashes of RED as blood inevitably flows but I was glad to see this film succeed of doing vampires justice without even the slightest shade of red. Oh and before I close I have to bring attention to one scene in particular that I found great. The vampire lady was clearly the most powerful character in the movie and was capable of ripping people’s limbs off with minimal effort. We see numerous times that she’s capable of taking down anyone she wants and we watch her track potential victims throughout. There is one scene though where roles reverse. Back at the vampire’s apartment, when she’s flirting with Arash (in a vampire costume), we see the hunter let her guard down and allow herself to become the “prey” romantically. Obviously we know she has the real power the entire time but it was a fun scene to watch! This movie was very well made, had quite the distinct style, and was certainly memorable. While I loved much about the movie, especially the style and cinematography, the lack of an even remotely dynamic story made the movie feel longer than it’s hour and forty-seven minutes. 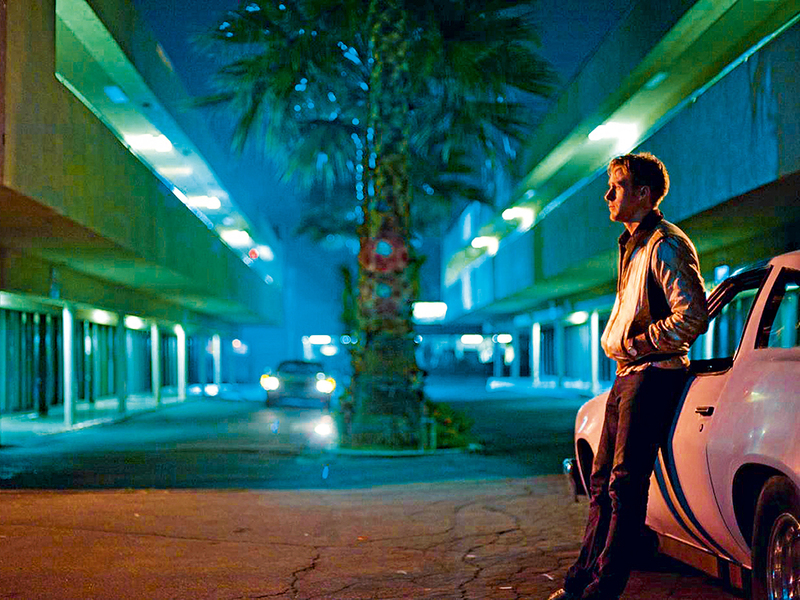 After I finished watching Nicolas Winding Refn’s Drive back when it premiered in 2011 all I wanted was a scorpion jacket, driving gloves, a toothpick, and to drive fast. Since then I’ve bought the movie on bluray and often list it as one of my favorite movies ever. Any movie that reminds me of Drive (or the equally stylish Hotline Miami) tends to instantly make me smile and pay close attention, this is part of the reason why I loved Keanu Reeves in John Wick so much. In these past four years since Drive, I finally found a movie that compares in style in Adam Wingard’s The Guest. Let’s start with a brief description of what this movie is about. On a seemingly random and unimportant day, the Peterson family is visited by Afghanistan war veteran David (Dan Stevens). Mrs. Peterson, still mourning the death of her son Caleb, is quick to invite David in and offer him a room for the night after he explains that he was a friend of her son. The almost jarringly polite David is readily taken in by the entire family. Within the course of a few days David is picking up the younger Peterson son from school, attending parties with Anna Peterson (Maika Monroe), listening to the Mr. Peterson’s work troubles over beers, and helping Mrs. Peterson with household chores. Everything is not as it seems for the Peterson family and only the smartest Peterson, Anna, is suspicious of David’s story. Without wanting to spoil anything I’ll leave it that. One of my favorite things about this movie was the cinematography. The style of this film is palpable as it was with the other movies I mentioned in opening this review. That scene near the end of the film at the high school gymnasium has been on my mind since the movie ended. That entire scene and the ones like it that preceded it simply exude coolness. Pretty great right?! 5/5 stars for the film’s soundtrack but unfortunately this isn’t a soundtrack review. My main gripe with the movie doesn’t have anything to do with the over-the-top action or the intentionally ridiculous acting and script. I understand that these things were consciously put into the film to contribute to the overall aura. My main complaint was with the story. The film begins intentionally slow and progresses steadily towards its final loud crescendo but it does so in a way that felt too unbalanced for me. Maybe I’m just nitpicking but I think the film could have been better balanced. To add to that, the movie had so many overly stylish moments that bordered on cheesy. I’m convinced these were also by design but I’m still marking the film down a bit for them. The major thing I didn’t like about the story was simply that it wasn’t all that special. The explanation for what happens in the second half of the movie doesn’t seem as something created for the purpose of writing a good story as much as just an excuse for characters to run wild, have shootouts, and chase each other in cars. I can’t help but return to Drive and compare the two given all the similarities and I know that’s unfair to this movie because it deserves to exist on its own but those are just my own biases. In the end a 3.5 is probably lower than many people would give this movie but the story felt too noticeably weak to me when compared to the excellent style of the film. It was still a highly enjoyable movie and I would recommend it to anyone looking for a fun and stylish movie. But come on, compare the two and tell me you don’t see the similarities!